If you have a startup company or are a freelancer, working from coffee shop to coffee shop isn’t always the best office space solution. It may be time to branch out and relocate to a shared office space providing not only a creative environment, but also giving you and other business associates a place to brainstorm and innovate. Posh truly describes the artsy, girly atmosphere of the space. The main stand out for Posh is that it is a workspace community for women. There are 4 types of annual contracts: glitz, glimmer, sparkle, and shine. Each offering more benefits and access. However, there are also short-term leases available. Shine, the highest contract level, guarantees hours in private offices and conference rooms each month as well as exclusive networking events with access to their interns. Soma Vida is the best of both worlds as it is has both yoga studios, offering various classes, as well as rooms for co-working and conferencing. The rooms are clean, relaxing, and modern with the options of hourly, daily, or monthly passes. Besides all the “wellness” classes they host, there are networking events, workshops, blogging circles and even a wellness retreat for those that decide to utilize their office spaces. BusinesSuites Westlake is designed for members who prefer a very professional and minimalistic atmosphere. With large windows revealing stunning views of downtown, BusinesSuites Westlake offers private offices and conference rooms with monthly to long-term contracts. It even offers a workout room to get in shape in between meetings. Set up in an up and coming area in Austin, Denizen Cowork is affordable and full of other people running start-ups. This organization emphasizes community where members help each other through networking and increasing everyday productivity. Each member is also encouraged to host events and teach classes that showcase their work while benefiting other members. Createscape Coworking has a warm and modern classroom feel that caters to creative professionals like filmmakers, animators, photographers and designers. With reasonably low rates starting at $15 a day, you can utilize their private conference rooms, take advantage of their video and photo equipment discounts, and access to social events that happen throughout the month. KEYSER is a cutting edge, commercial real estate advisory firm that exclusively represents global tenants and corporate space users of office, retail, industrial, medical, non-profit, and educational space. Services include Transaction Management, Project Management, Site Selection, Space Efficiency Planning, Capital Markets / Corporate Finance, Lease Portfolio Services, Strategic Advisory Services, Incentives Negotiation, Demographics, and Subleases / Dispositions. If you are tired of working from coffee shop to coffee shop, it may be time to look into running your business from a shared office space. A shared office space gives you flexibility and lower overhead with the benefit of having a professional workspace. Located on Washington Street, COHOOTS’ space provides an open, friendly environment where members can network, share resources, and collaborate to expand their business. COHOOT hosts weekly events like workshops, guest speakers, and happy hours to foster their community, social, and educational ideology. The space its self has a modern, updated design with everything a growing business needs including a kitchen, coffee shop, conference rooms, private phone booths for video conferencing, commercial broadband Wi-Fi, and a full-time community director to help with member’s needs. Occupying the first two floors of a high-rise in midtown Phoenix, Mod has a comfortable, urban design with a young and creative atmosphere. Mod provides a workspace, a café, event venue, and a bar for ending those long workdays. The café receives daily raves about the delicious food and the bar has a variety of wines, beers, and food options as well. Mod has a hassle free pay-as-you-go method allowing its members full access to Wi-Fi, a technical support team, printing services, private meeting rooms, and a concierge. Mod currently has plans underway to network globally, providing even further resources and location options. Regus is a huge corporate facility with over 3,000 locations worldwide. They provide rentable office spaces, business centers, executive suits, and corporate offices. Regus has co-working space, but offers businesses more privacy options than other shared offices spaces. All rentable spaces come furnished with the option of hourly, daily, weekly, monthly, or yearly memberships. The offices located on Tatum offer a friendly staff equipped to handle daily needs and concerns. The space itself has a very clean, professional, and corporate feeling. It makes sense that Union WorkSpace is creative and architecturally focused given that it’s located on the second floor of a construction and architect firm. The space has a minimalist and clean vibe open to all professionals with a custom mill and steel work desk and a Herman Miller Aeron chair. The 4-month minimum membership allows members 24/7 access to a workspace, conference room, a wireless Internet, and an on-site notary ideal for those who work unusual hours. CoWorking on 15th Ave is located off the 15th Avenue bike path just outside downtown that seems to suit their mentality of maintaining a healthy lifestyle. At CoWorking on 15th Ave, members are encouraged to not only work in a spacious and easygoing atmosphere but to also participate in bike riding, hiking, and other active events set up by partnerships. There are also biyearly events that run a weeklong targeted at networking and educating its members. “We are very pleased to announce our newest partnership with the Arizona Charter School Association,” stated Jeffrey Houser, head of Keyser’s rapidly growing Educational Services Division. “Securing cost effective and scalable real estate solutions is one of the biggest challenges educators face today. This partnership with the Association will enable us to increasingly serve and add value to those educators who are working tirelessly to close the education gap we face as a state and nation,” added Houser. The Arizona Charter Schools Association is excited to announce its newest partnership with Keyser, a commercial brokerage firm that specializes in tenant only representation. Keyser has been able to provide unique and customized support to many schools, overcoming the many hurdles charters face when identifying a potential site. Keyser has worked tirelessly to support our new schools by working with land and building owners to create cost efficient solutions so students can have a place to call home. With Keyser’s extensive expertise and innovative tools together with the resources and knowledge of the Association, we will be able to fully support our schools with all facility needs from start to finish. From providing information about financing options, to site selection, to selecting architects and builders, we will now be able to provide an all-encompassing support system for every step along the way. To learn more about how we can best support your school and facility needs, please contact Cameron Quick, Director of Member and Business Services, at: cameron@azcharters.org. Arizona Charter Schools Association is a nonprofit organization who believes that all Arizona students should have access to a high quality public school. We are focused on creating and sharing innovative programs designed to support leaders and teachers as they work to improve student achievement. The Association supports student achievement through high quality charter schools, advocates for student equity and charter school autonomy, and leads Arizona charter schools as a sustainable, strong, credible organization. Following is an outline of a presentation given by Carlisle Driggers at Bambi Lake. leaders keep on learning, but they never arrive. they are not demanding, always looking over people’s shoulders, or heavy handed. to either run or be demanding in a crisis. Effective leaders address the challenges. 5. Effective leaders sell; they rarely tell. They begin with vision, purpose and values. They influence people rather than telling them what to do. 6. Effective leaders identify and build on strengths while they manage weaknesses. to them. They don’t let weaknesses control the organization. quickly get back to their passion. 10. Effective leaders know the critical importance of getting the right people on the bus. They have the right people in the organization, serving in the right positions. negative to positive. They get out and talk a different, positive message. much more should Christian leaders pray for guidance? to help those around him or her become effective leaders. How are you serving your clients, partners, friends, family and co-workers? Leave a comment below! Needless to say, your reception area says a lot about your company. That’s why we’ve compiled photos of inspiring technology company reception areas – from Airbnb to GitHub – in hopes of inspiring you to spruce up the area that influences first impressions. Stepping into the GitHub reception area gives you a White House, presidential feel. Stepping into Square headquarters gives you the clean, refreshed feeling associated with Square products. The AirBnb reception area makes you feel right at home. Facebook’s reception area pays homage to it’s college campus beginnings. You can’t miss the pink mustached reception area that greet visitors at Lyft. It’s almost like the receptionist is working inside the stache. Tanga, a small, yet rapidly growing technology company that offers daily sales & weekly specials, greets visitors with vibrant colors and movie posters in the background. The Pinterest reception area matches the cluttered look of their user generated website. The Instagram reception area is simple with a vintage camera collection on display. Twitter’s single headquarter location features a reception area that shows the company has grown up from it’s startup days. Yammer’s impressive reception area features art deco columns of the original building. From sealed concrete floors to high exposed ceiling, this reception area reflects the high end of the social network that Yammer represents. The reception area for Zillow, the leading real estate marketplace, resembles the residential homes it presents. YouTube’s vibrant reception area greets visitors with video thumbnails from it’s online community. LinkedIn’s reception area with exposed ceilings showcase a professional environment. The reception area at GoPro encourages you to be a hero. The Box office reception area features a slide to ride while you wait. What inspiring technology company reception areas have you visited? Let us know in the comments. In this post, we help give entrepreneurs an idea of how to calculate office space by using the Keyser iPhone app to reverse engineer the Dropbox San Francisco Headquarters. The design for Dropbox’s China Basin headquarters can be summed up into one word: innovative. Here’s a few pieces of information about Dropbox that will help us estimate their office space needs. – Needs to plan for projected growth that could more than quadruple staff. : If cubicles are the suburbs, then Dropbox HQ is downtown. Let’s assume that with the exception of the executive offices, all departments work in confined spaces in teams of 4. Think about how a coffee shop works. That’s how we envision the Dropbox office space operating to keep the collaborative newsroom feel. : Engineers and Product Teams enjoy a large office space that can be also used as a shared meeting space. 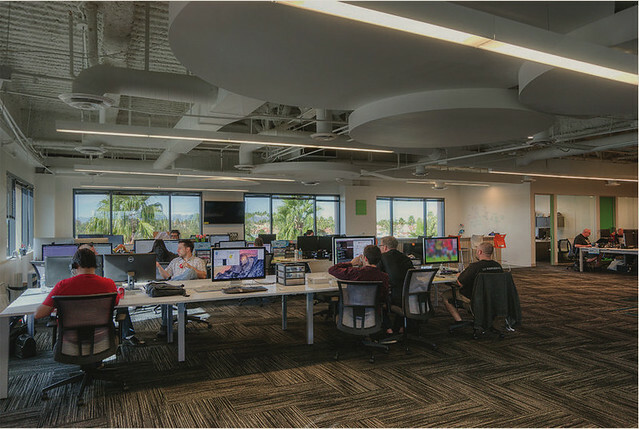 : With 168 IT employees, we’ll allocate 42 “small offices” or 4200 square feet of office space to information technology. 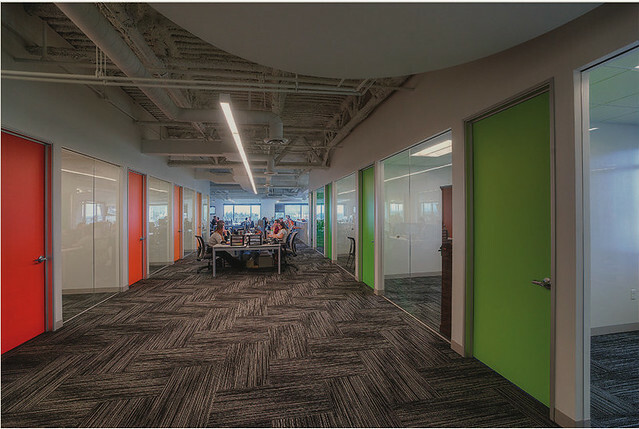 : Each operations team shares the equivalent of standard sized office space while sales and human resources teams split the equivalent of shared small cubes. : Since Dropbox has a distinctive look to it’s product experience and marketing, let’s assume the Creative and Marketing teams share medium sized offices. : Admins share the equivalent of a medium sized cube, while all other employees share the equivalent of a large cube. With several meeting spaces and informal lounges, the need for conference rooms is limited. Let’s account for one large conference room (seating 16-20 people), two medium conference rooms (seating 8-10 people) and four small conference rooms (seating 4-6 people). Also, let’s assume that Dropbox has a large training room that can accommodate up to 150 people at once. Let’s assume that Dropbox has a large reception area welcoming guests that takes up about 1,125 square feet. Also, since we know Dropbox employees can take a break at the gym, let’s account for 1,000 square feet for a large fitness room. Let’s assume one large and one small copy room space for every 100 employees would equate to 8 large and 8 small copy rooms throughout the Dropbox headquarters. Let’s also make general assumptions that the Dropbox building has a couple small storage closets. Dropbox believes that all spaces – particularly the all-too-often neglected office – deserves attentive interventions. A large kitchen area with a walk up bar exists for employees to grab a bite to eat. We’ll assume that Dropbox’s bar is about five times the size of an average coffee bar space, and that the large break room is designed to seat up to half of the 800 Dropbox employees at any given time. Let’s allocate two large server rooms for the needs of Dropbox employees. Bottom line: the Dropbox headquarters is more than an office – it’s an open space planned to achieve the company’s desire that everyone maintain a connection to overall density. It’s organized, but intensively active and vibrant. Based on our office space assumptions and estimates, let’s submit and calculate the Dropbox office space needs in terms of square footage. The Keyser iPhone app will automatically calculate hallways circulation square footage, as well as load factor, usable space and the total amount of rentable square feet. This calculation is especially useful to help narrow down your office space search. Without further ado, here is our reversed engineered calculation of the Dropbox San Francisco headquarters: 85,002 Square Feet. Standard commercial leases require a 3-year minimum agreement. And for many small businesses, that can seem like a lifelong commitment. You don’t want to put your company in a detrimental obligation, but you need the space so you can continue growing. What can you do? Well, luckily the commercial market recognized this need and offered a variety of choices for flexible office space leases. When you’re looking for this kind of space, evaluate your objectives and find the type of office that best fits your needs. You know those Halloween tents that come into town a few weeks before the holiday and leave a few days after? That’s a pop-up retail space. This kind of space works great for mobile art exhibits, beginning designers or small business that need to do market testing. Also, eCommerce stores that want an occasional brick-and-mortar option make excellent pop-up space users. You’ll get very flexible terms and short lease agreements with this type of space. And rental rates fall significantly lower than traditional costs. These flexible office space leases come equipped with receptionists, an IT department, office managers and telephone operators. It will have easily customized space and offer the latest technology. While you have private areas for working, your company shares common areas and conference rooms with other tenants. Over the years, landlords have created several variations to the typical executive suites model. Virtual office space charges tenants for the use of a professional address and telephone number, but they may only use the space on a limited basis each month. Co-working spaces feature the same concept as executive suites, but focus more on creative professionals that prefer collaborative environments. You get tons of flexibility with these offices, with terms as short as just a week. It’s often significantly more expensive than traditional office space. But when you account for the benefits, it all evens out. A sublease provides the flexibility, benefits and opportunity for most businesses. Essentially, you partner with another company to share their lease with them. And if they decide to vacate the space, you’ll often get first rights to occupancy. Sublease terms depend on the agreement between you and the sub-lessor. Generally, you’ll share common areas, basic office equipment and you may be able to use their furniture for free. And if you’re quickly growing, you can come to an agreement where you take over the lease at the end of their terms. That kind of setup can make rapid growth at a startup much less stressful. Ultimately, you want to find the type of place that works best with your goals, objectives and culture. When you understand that, you can find the perfect space to grow together as a company. Which type of flexible office space leases would work best for your business? Katharine Halpin, accomplished speaker, executive coaching industry leader, and CEO and Founding Principal of The Halpin Companies, has announced the Alignment for Success book launch to be held next month at Keyser’s Scottsdale Headquarters. Based on author Katharine Halpin’s 20 years of coaching business leaders to even-greater performance Alignment for Success focuses on the all-important human aspect of business relationships that create high-performing teams. With Katharine’s approach you will be able to create healthy work environments where everyone wants to bring their best self while creating record results. thereby grows the value of your company quickly and strategically. Don’t miss your chance to meet the author and purchase your copy of Alignment for Success! Please RSVP to Celeste Suarez at csuarez@keyserco.com. Many companies need to control office space rental costs. With numerous other monthly expenses, a high rental rate could become the difference between the success and failure of the business. Most will jump immediately to the second tactic. But don’t dismiss the first tactic too quickly. Consider it from an efficiency and quality standpoint, and you may find that a smaller space serves your needs perfectly. Everything in life has limitations. You could search in the best market with high leverage and hire the best representatives. But there comes a point when a landlord can’t offer a better price, regardless of what you do. And when that happens, it’s time to look for efficiency. Companies frequently rent far more space than needed. Despite downsizing, poor business conditions and tight financial situations, businesses sit in huge offices with tons of unused areas. Evaluate a space from an ergonomic standpoint. Brainstorm creative ways that you can work with your team in a smaller space. Just reducing your workplace space by 10% can uncover significant savings on your office space rental costs. Perhaps it’s counter-intuitive to the penny-pinching mindset. But when searching for an office look for spaces in a higher quality building. Companies that couple this with an efficiency approach find that they save money in the upgrade. Many new, modern spaces build ergonomic principles directly into the layout of the building. You’ll get an advantage because the space was made with you in mind. And even though the building may offer a higher quality standard, you can pay less because you’ll need less. At the end of the day, you may just need the larger space. When that happens, you must rely on sharp negotiation skills to land the office space of your dreams. If you choose to go this route, enlist the help of a tenant representative. (In fact, you could benefit from one with any route you choose.) A tenant representative has the experience, knowledge and abilities to negotiation the best deal on your behalf. They can focus their searches and negotiations on getting you the best price per square foot. In fact, you’ll desire this outcome even if you decide to go with a smaller space! Our world-class tenant representatives make sure you get the best deal available. We’ll work selflessly by your side to help you control office space rental costs. Contact us today and share how we can serve your company.